Brainstorm is an MMORTS being developed by Genia, whose slogan is, “Knowledge-Powered Games.” As that might imply, Brainstorm has a twist that makes it a bit different than most browser-based MMORTS. This twist is a setting where “knowledge is power,” and everything you do will be dependent on that factor. If you like trivia, enjoy quizzes, or generally just enjoy testing your mind, you will probably find some sort of enjoyment from Brainstorm. So, if you think you have what it takes to take over the virtual world using your real-world knowledge, you may want to check this game out. There’s honestly not a whole lot of customization. If you’ve played an MMORTS in the past, you’ll be familiar with the lack of customization this genre offers. You’ll also understand that it doesn’t detract from the game at all. In Brainstorm, you’ll be free to make choices, but these are the same choices other people will run into, which means there will be a lot of people out there with similar outcomes to you. Most of your choice-making will come in designing your base and choosing how to expand, which is where you would expect it to be. The game has very nice animated 2D art-work. It has a realistic feel, but with an idealized slant. Rather than dark-and-grimy, you’ll find a lot of bright colors. This gives the game a happy or progressive feeling that you’re participating in something great. Which, I suppose, is the sort of feelings you’re supposed to feel while playing Brain Storm. Either way, I enjoyed the art style and felt it complimented the game a lot. As with most browser-based MMORTS, you will be playing the game almost completely with the mouse. This means the responsiveness and effectiveness of the GUI will dictate how well the ‘controls’ work. While playing, I did notice a slight laggyness to the responsiveness. Other than that, I didn’t notice any problems with the controls. The UI was easy to learn, especially after you participate in the tutorial, so there was no issue with it being confusing. All-in-all, I have to say I was pleased with the controls in Brain Storm. Community is an important part of Brain Storm, or so it is said. Constantly, you are encouraged to work with others as it is the best way to create the best, most powerful Oracle (A feature I’ll get into in the “gameplay” section). To be able to succeed, you will need to join what is known as an Alliance, which is (as the name suggests) an alliance of players. Communication is done via the forums, or the built-in chatroom function. So far, the community of the game feels small, but that is to be expected of a beta game. Brain Storm starts out feeling almost exactly like all other RTS games out there. You build your city, setting up specialized buildings to create specialized units and gain access to new things. Expanding your city is important to the gameplay, just like other MMORTS. Where things get different is the lack of violence, and the emphasis on trivia. Rather than creating armies, you’ll create experts to do research to unlock new knowledge fragments which are (essentially) trivia questions on different aspects of life. It can be something like a bikini and who created it, to information about how sniffer dogs are used to find truffles. Mastering these knowledge fragments will let you use them in your own city. If you master sniffer dogs, you can then use them to help with security. If you get the bikini fragment, you might find a use for it somewhere else as clothing for some expert. You can also use any bit of knowledge you get as part of your city’s “trivia” shield. This shield will help protect you against ‘attacks’ from outside sources (such as other players). If you like answering odd bits of trivia, you’ll enjoy this game a lot. The big end-goal of this game is to create the best Oracle. To accomplish this, you’ll need the help of your fellow players and will end up joining an Alliance. The goal of the Oracle is to display just how knowledgeable you and your fellows are, proving that you are the best. Collecting knowledge fragments, improving your city, expanding your domain and production… all of this will go towards the creation and improving of your Oracle. As I mentioned, a big part of the game is building up your city. This is done using specialized resources, such as the potentially infinite resource of Genium. 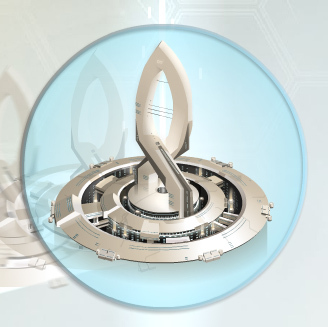 You will plan and upgrade buildings that will give you access to newer and better stuff. 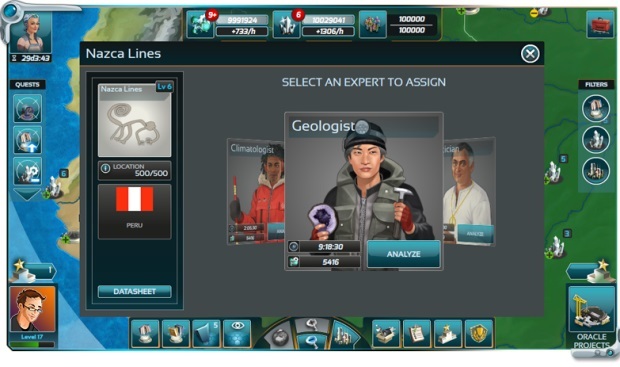 For example, to get to the best sources of Genium, you will need to create a Geology lab and upgrade it further and further. Basically, it’s the same concept as other MMORTS games, just with a slightly different process for getting to the end goal. One thing you will notice early on is the possible uses of Credits. As you might have guessed, credits are a premium currency that you can get by spending real-life money. You can use it to automate some parts of your city, or if you find you’re not particularly good at the trivia questions you can use it to gain access to the in-game wikipedia of knowledge. If you fail to answer a question correctly while attempting to master it, you can use Credits to get a second chance, too. Generally, these features are relatively cheap, but they do give paying users a certain edge. But, then again, a few fast wiki or google searches can make the in-game options completely null. Another familiar feature will be the creation of newer worlds. As time progresses, older servers (or worlds) will become stagnant or clogged with older, more advanced users. Or maybe there will simply just be too many users on a single server. Other games have combated this with the creation of newer servers, and it seems like Brain Storm will also be going down that route. I am currently playing on the newest server, which is just seven days old as of writing. There are two other servers, with one that is about a month old. This is good as it lets people join whichever type of environment they want to. 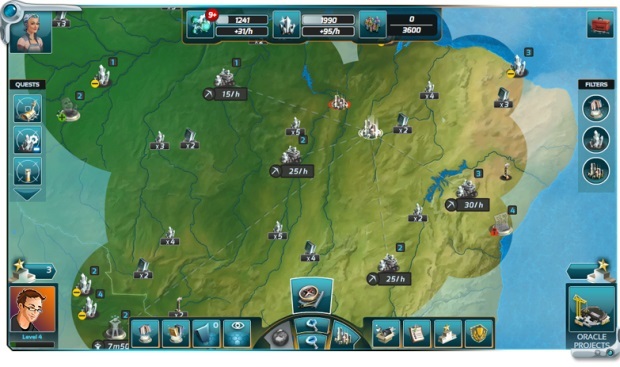 Brain Storm is certainly a unique game, which is refreshing with the staggering amount of generic MMORTS games that come out on the browser each year. Of course, this doesn’t mean Brain Storm is completely alien – there are a lot of features that are quite familiar to veterans of the genre. However, I’m sure anyone that gives the game a try will agree that is does have its own special twist. 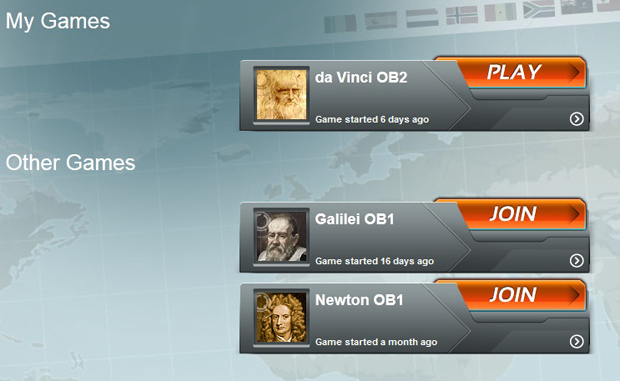 In the end, I can see how a lot of people might enjoy this type of knowledge-based game. So, while I will probably not be playing it much myself, I can safely recommended it to anyone looking for a new browser-based MMORTS. Keen Software House is celebrating the 2nd anniversary of Space Engineers, with sales exceeding 1.6 million copies since its release.